In the spring of the year 18——, the Shah-in-Shah, the great, exalted and holy monarch, the absolute ruler and overlord of all the lands of Persia, began to feel a sense of malaise of a kind he had never experienced before. And so begins Joseph Roth’s novel, The String of Pearls. If it seems like the beginning of a fairy tale, or folk tale, then its original title, Die Geschichte von der 1002en Nacht (The Tale of the 1002nd Night) would probably support that. For me the beginning of this novel felt so much like a Maupassant story that I wondered how Roth was going to spin it out for the whole length of a novel. But Roth is playing a different game here; what it is I’m not quite sure, but he’s certainly playing around with our expectations of how the story is going to proceed. So, the story begins around 1870-ish, with the Shah of Persia deciding to visit Vienna as a means to improve his physical and psychological health. After some amusing delays (you will have to read it to discover these) he arrives in Vienna and is treated with respect by the authorities and great interest by the populace. We are introduced to Baron Taittinger, Captain of the Ninth Dragoons, who has been seconded to assist with the running of the Shah’s visit. The Baron is a bit of a loveable idiot who likes to split human beings into three categories: ‘charmers’, ‘so-so’s’ and ‘bores’; there are too many bores around for the Baron’s liking. Meanwhile the Shah is treated to all sorts of entertainments, and it is whilst attending a ball that he is smitten by the Countess W. Bored with his harem of 365 wives he wants to fall in love with a Western woman. He had come to Europe to enjoy the singular, to forget the plural, to trespass on individual property, to break the law, just once, to experience the pleasure of unlawful possession and taste the particular, sophisticated pleasures of the European, the Christian, the Westerner. Used to geting what he wants the Shah demands that the countess is brought to him that evening. So what can the Austrian courtiers do? The Countess can’t be treated like a common prostitute and the Shah will feel snubbed if they refuse him his wish. It turns out that the Baron, who had been involved briefly with the countess before her marriage, had also had a brief fling with a girl, Mizzi Schinagl, daughter of a shopkeeper, who looks as if she could be the twin sister of the countess; it’s decided that she should ‘stand-in’ for the countess and be presented to the Shah. Mizzi, who is currently working in a brothel, is persuaded to do this and everything goes to plan. As a gift, the Shah gives Mizzi a string of pearls. He took the Captain as he was, and was fond of him, with his cheery heartlessness, his incapacity to think beyond a couple of thoughts, for which his skull was far too roomy, his insignificant love affairs and childish infatuations, and the pointless and unconnected remarks that came out of his mouth, seemingly at random. He was a mediocre officer, who didn’t care about his comrades, his men, his career. The Baron is a bit of a blockhead who just breezes through life but as his money runs out and he is forced to resign from the army, due to a scandal over some dodgy literature, he has to depend on others. But it’s too late for any drastic changes to be made to his life. In telling this story Roth avoids giving us what we want, instead he veers away at the last minute from doing so. For example, near the end of the book it looks like the Baron realises that he loves, or at least cares for, Mizzi and contemplates making an honest woman of her…but then he doesn’t do anything about it; he appears to just forget about it. We expect the Baron to realise the errors of his way of life but he does no such thing, instead he misses the army life where he was happiest and tries to turn the clock back. 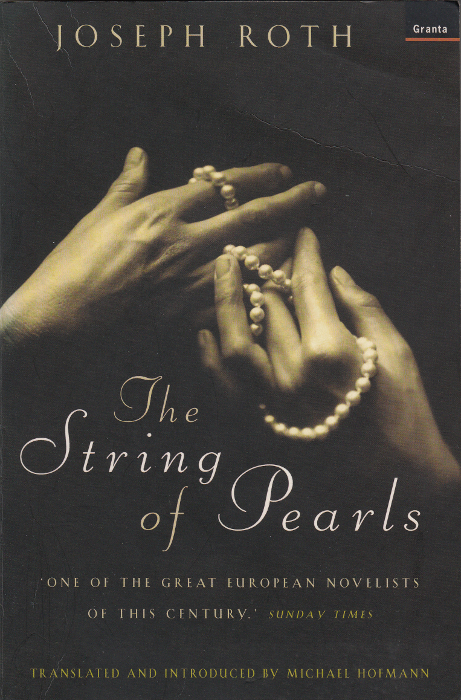 …The String of Pearls is a strange book: frothy, highly decorated, full of money and costumes and ambience and light, a pitiless morality with the cruelty of fable. The novelist keeps skipping ahead of the reader, into ever more distressing and constricting settings and situations—but he never stops skipping. Its scenes and images live in the memory: in this short book there is enough for many books. It’s certainly packed with a multitude of characters and memorable scenes that it will be difficult to forget. The novel comes full circle with another visit by the Shah but this time the Baron is in disgrace. The last paragraph contains a comment by a writer that could easily be Roth’s justification for writing the novel. I might be capable of making figures that have heart, conscience, passion, emotion and decency. But there’s no call for that at all in the world. People are only interested in monsters and freaks, so I give them their monsters. Monsters are what they want! I agree with the Baron: there are too many bores. I think I’d really like this one. The Baron was a bit of a loveable rogue really. Whilst I enjoyed reading it it seemed a bit unfocused and had so many characters that it was a bit confusing. But now I’ve finished it I can say it was a book I enjoyed. I rather like Roth, to put it mildly, so this is a bit of a must-read for me. Interesting that it comes together better in memory perhaps than at the time which I tend to take as a good sign. However, I still haven’t read The Radetzky March and I want to reread Hotel Europa so it may take me a while to get to. Sounds fun though and Hofmann is the translator one would want for Roth I think.